Mordian 7th Regiment: Heresy Era Thousand Sons - Assault Squad Mekhata painting begins, and some characters! Heresy Era Thousand Sons - Assault Squad Mekhata painting begins, and some characters! A reasonably quiet weekend for a change, which meant some extra hobby time in the mornings before it got too hot in the hobby loft. After finishing off the Contemptors, I took a look and the proposed army list for NOVA and pulled out the next batch of minis intended to make the trip out to the east coast, namely Assault Squad Mekhata, and a couple characters. Nothing too fancy so far, just laying in all the base reds. Naturally as part of this process I managed to knock over the pot of Carroburg Crimson wash and make a huge mess. Stopped by the GW shop and picked up one of the new bigger wash bottles, which of course only means that the next time I tip it over, it's going to be an even bigger mess! While I was about it I laid in the reds on a couple character models for the force as well, another Sorcerer (you can't have too many Sorcerers in a Thousand Sons army after all), the special edition Tartaros Praetor and an Apothecary to accompany one of the tactical squads. 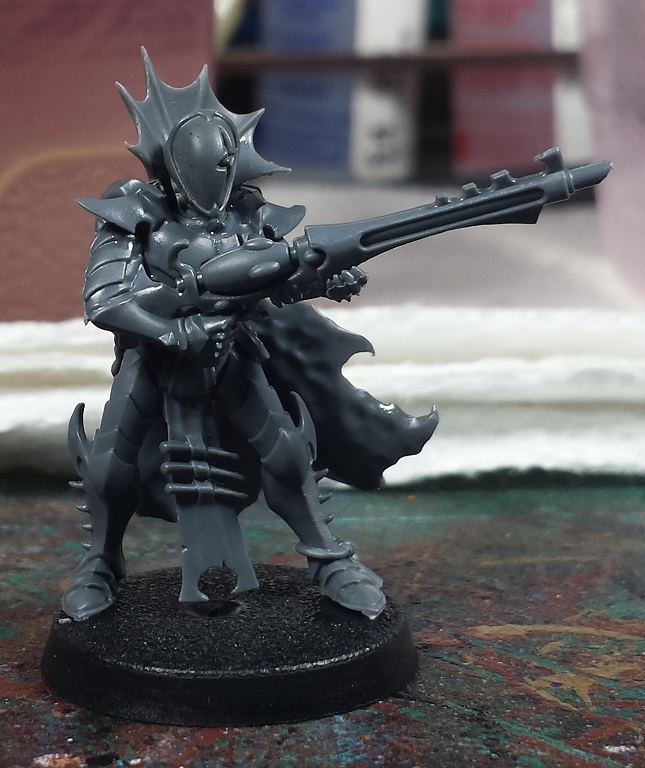 In general the Apothecaries in the Heresy eschew the 'all-white' aesthetic of their modern 40k brethren, but he'll be getting some white detailing here and there to help him stand out a bit. Lastly, on a lark I broke out the bits boxes and tried knocking together the first of the basic Corsairs. Pretty straightforward - legs, arms and front torso from the Kabalite Warriors kit, the cape/rear torso from the Black Ark Corsairs kit (which requires a fair bit of cutting and carving to fit, and the creepy helmet from the Wych kit. The initial intent was to use the similar blank-faced helmets from the Reaver kits but it turns out the rear scalloped armor on those heads interferes with the spiky collars on the corsair cloaks. Off to the bits sellers to come up with more Wych heads, it seems! Very nice. I had a chuckle imagining the outcome of having a 12ml bottle lurking near an unwary elbow. I do love how deep that red is, good work keeping everything going on it. Top tip for the big wash bottles. (from another blogger). Place them in a jello shot style cup while working on them. Helps prevent them from tipping over and catches any spills. Good looking bunch. I like the wash - looks like I'll need to get some myself. Lovely Ksuns. Wait, arn't they from Star Trek ? I gotta know, man... How do you just keep painting? What keeps you going? @Frothing Muppet: Thanks! It's a situation fraught with danger! @Da Masta Cheef: Cheers! Should be a fun unit once they're all built! @Rory Priest: Thanks man! Plugging away, with the NOVA deadline bearing down on me. Eep! @Manus: Thanks! Was definitely a fun model to build!